Well it's about now, a month or so out from Easter, that I start thinking about what we'll be eating. Easter's all about the kids right???? Wrong.... we usually do our fair share of entertaining at Easter, as the 4 day break gives me lots of time to get into the swing of the season. So while the kiddos are off digging around trees and turning up the pot plants and generally making like mayhem magnets in the backyard on their Easter Egg hunt, this is what we adults will be getting into... 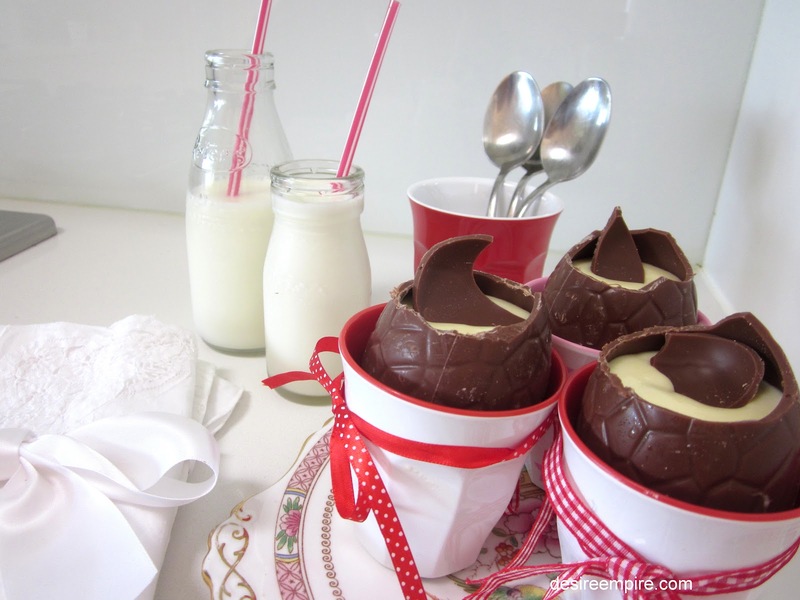 It's a White Chocolate and Passion fruit Mousse served in Easter Eggs. It was quick and easy to make and I think is set to impress. 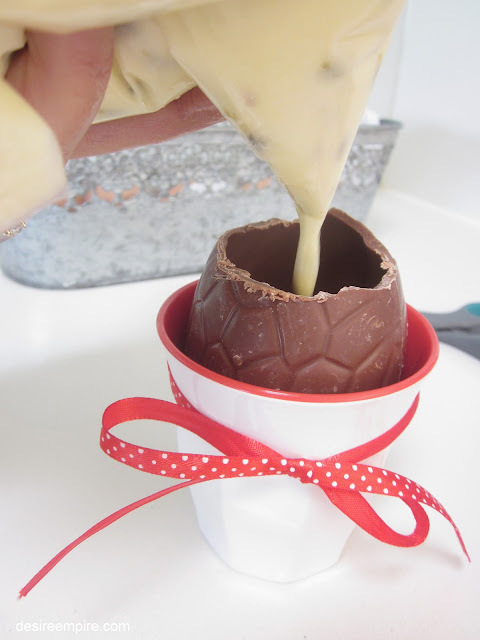 I didn't use all the mousse to fill the eggs and froze it to make Passionfruit ice cream. The big Beach House Brat said it was the best ice cream he'd ever tasted so this one is so worth the small amount of effort required. First take 6 medium sized Easter eggs (10cm or 4" in length) and cut their tops off about 1 inch from the top. You need to be gentle here, it's not difficult and will work, but definitely use a knife and not your thumbs. I cut with a serrated edged knife and the edges were a little bit uneven which is how I wanted it. Place them into a vessel of choice. I took one of these cups to the store, to make sure I'd get the look I was after. 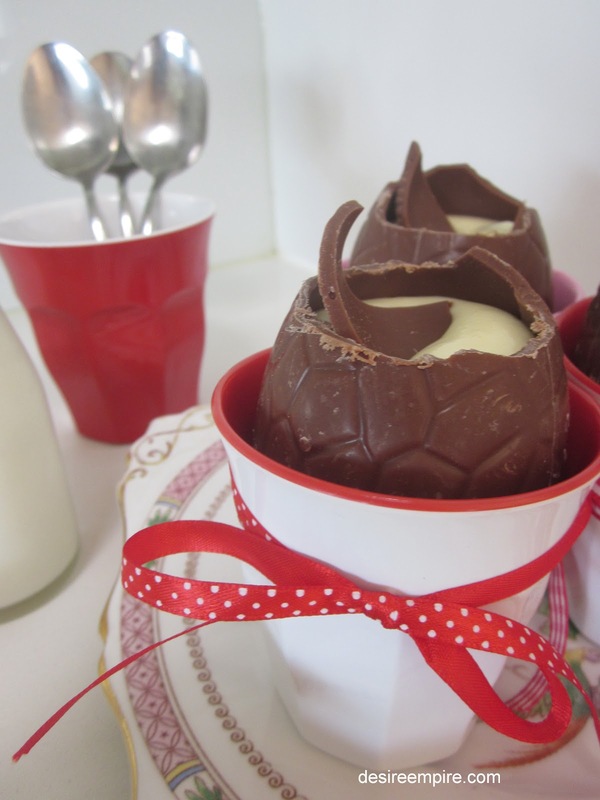 If you go smaller on the eggs, which I think I would do next time, so the kiddos can indulge as well. For the smaller version of this, you could use those Ikea Tea lights or one of those firm high sided designer patty pans to hold a smaller egg. 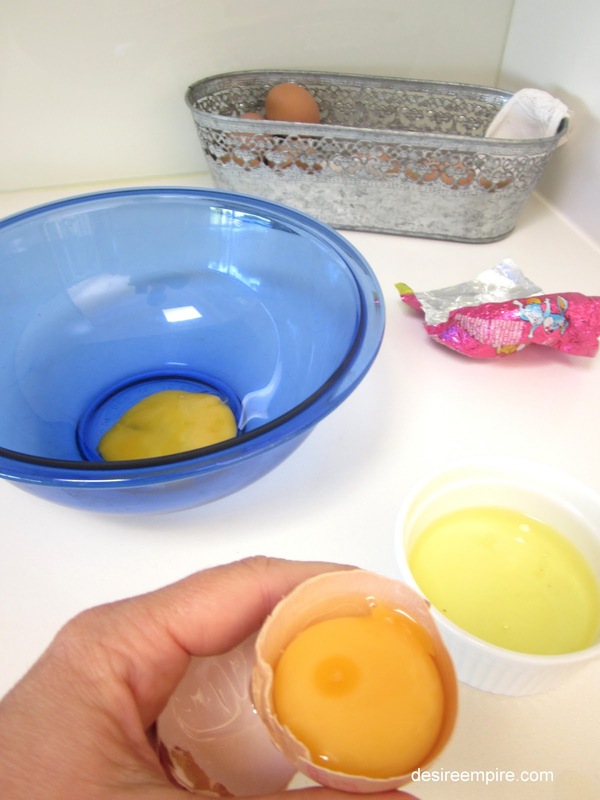 Seperate three eggs and beat the yolks with a 1/4 cup of caster sugar until pale and creamy. Fold in 1/2 cup of passionfruit pulp. To be honest I think you could use any type of fruit you fancied here, as long as it goes well with chocolate and is pureed. You could even make a chocolate mousse without fruit if you have a recipe for that. About 25 years ago I was making a fruit salad and an American friend was helping me and asked 'What do I do with this, do I peel it?' 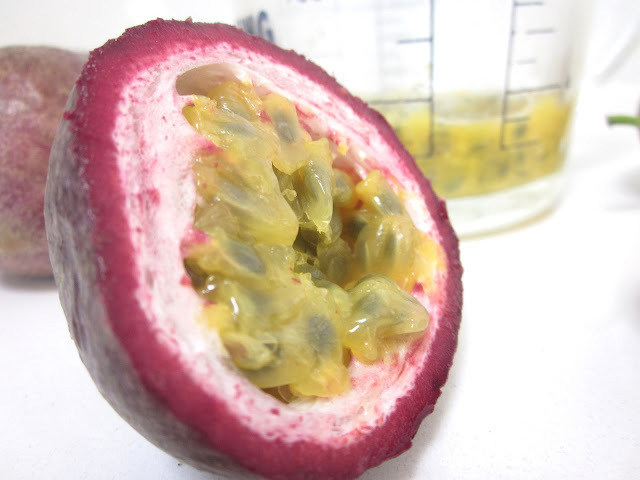 So not sure if passion fruit is common in America. It sure is popular here in Australia. When I was a kid everyone had a vine growing on the back fence. They are divine spread over icecream and go beautifully with chocolate. Next beat 300ml of thickened cream until soft peaks form. Melt 150g of white chocolate according to the directions on the packet and cool slightly. Beat the reserved egg whites separate to the cream, until peaks form. 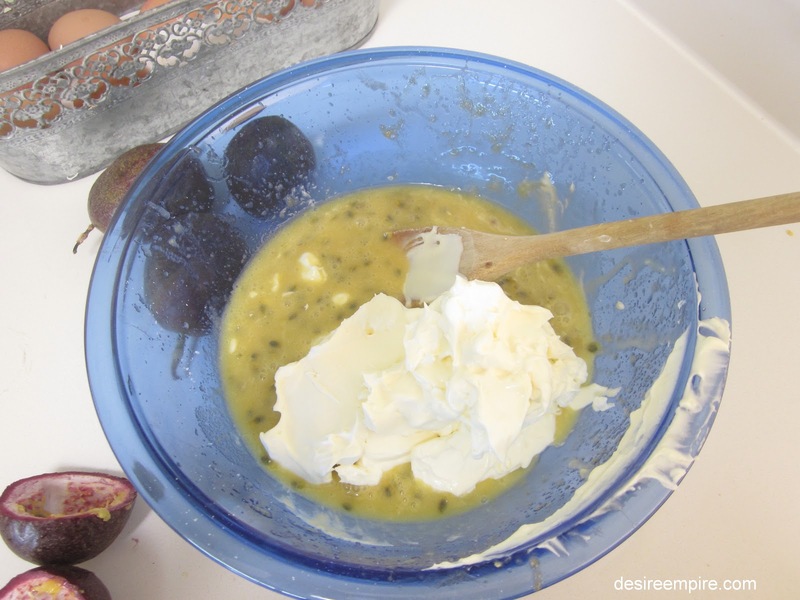 Fold the cream, egg whites and choclate into the passionate fruit mixture gently and one at a time. I find the best way to handle mousse is to pipe it into the vessel. This is so easy if you load up a plastic zip lock bag and close. The closure bit seems basic, but I exaggerate to clarify here, once I forgot to do that and I ended up with an awful mess. 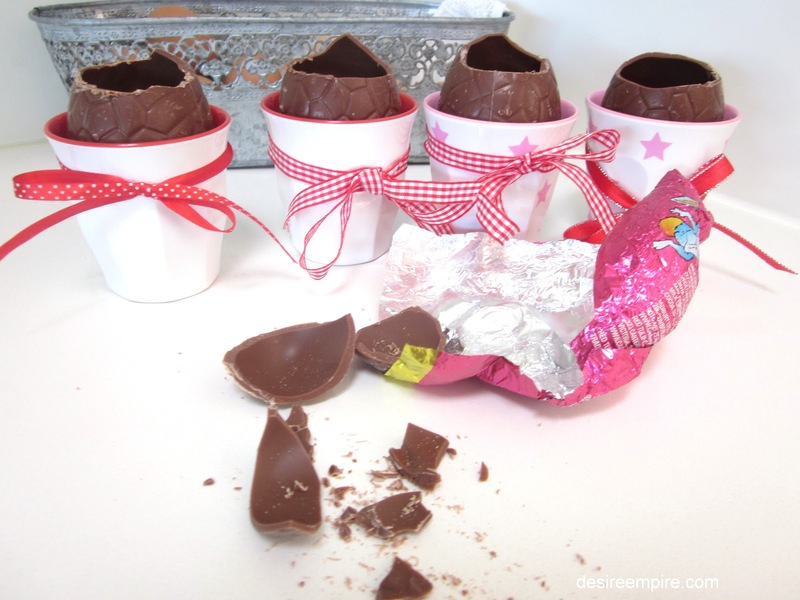 Snip a tiny corner of the bag and pipe into the Easter egg. The piping avoids the potential disasters of spooning in the mixture, where it inevitably goes everywhere but the intended spot. Leave to set in the fridge for 1 hour. 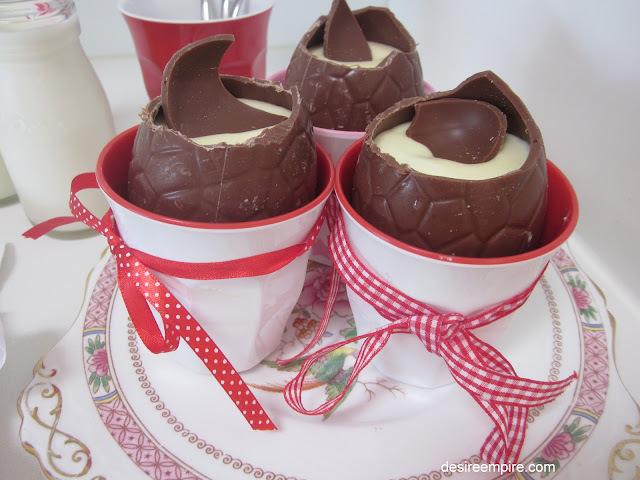 Dress with chocolate chards reserved from the top of the egg and serve. Off course I don't have to tell you that you are going to be praised beyond belief for producing this one. 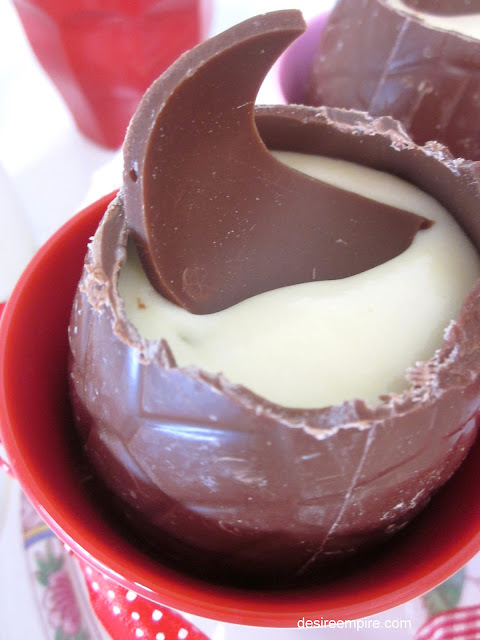 It is deadly decadent and you will be forever remembered as an Easter Angel. Cue soft music right about now!!!! I have made this dessert for two lovely Northern beaches Blogging friends who are coming to the Beach house for lunch today. As fellow bloggers, you can imagine the pressure I'm under. I only blog the good bits of the Beach House and of course these guys are going to see the works....the good, the bad and the down right ugly of my home. Well I think I've at least got dessert covered. It's great to be having a lunch date with these girls, one whom I've never met , but blogging is opening lots of doors for me and this will be another one I'm sure. I styled this up for a little kiddo afternoon tea. They are getting the left over mousse which as I said, I froze into home made ice cream, with a few chocky chards on the side. Just freeze the mousse and stir hourly (about twice) until it has frozen. I've never bothered to make ice cream before, but after tasting this, it is so worth it. Yum!!!!. Happy weekend to all you lovely people!!!!! I've got a date with an old friend this weekend. Mr Beach House is cool with it. He'd rather be sailing I think. This guy was in his mummy's tum at my parents' wedding and I have grown up with him and I'm going to his 50th. Yikes!!!! He can't be 50 can he??? I had so much fun taking my new body out for a spin last weekend that I'm doing it all again this weekend. This time it's a dinner in the city for 30 people. The new me is really enjoying coming out from under the baby rock....Life is good right now!!!!!! As a former Australian (now an American), I can tell you two things that are not common in the US: passionfruit and large Easter eggs. 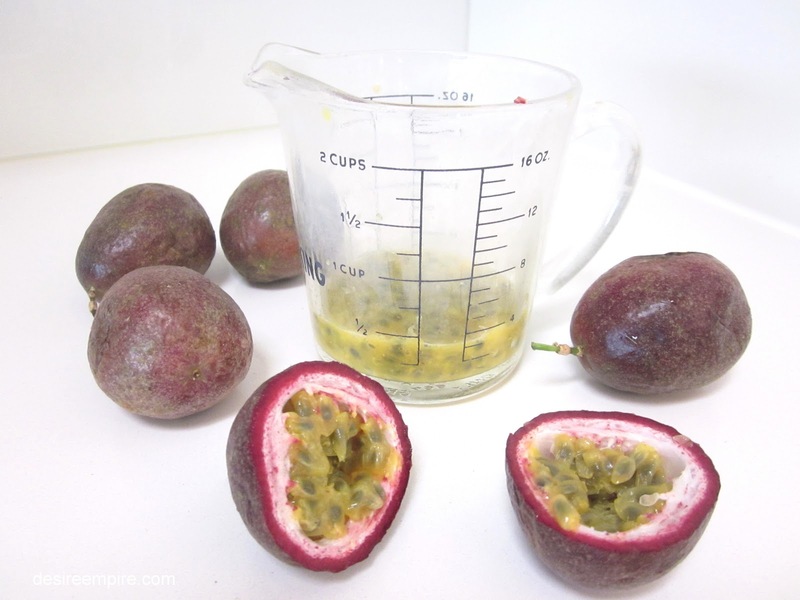 I saw passionfruit at my local supermarket last week, but they were $2.50 EACH, so I just indulged myself with two. Your dessert sounds really yummy! They are so pretty! Thank you for sharing at Potpourri Friday! Your participation is apppreciated! they sound very yummy! hope you had a great day & have a good weekend too! Love this! Great GREAT colorful photos. They definitely stand out in the linky party where I found you. Keep up the great work. 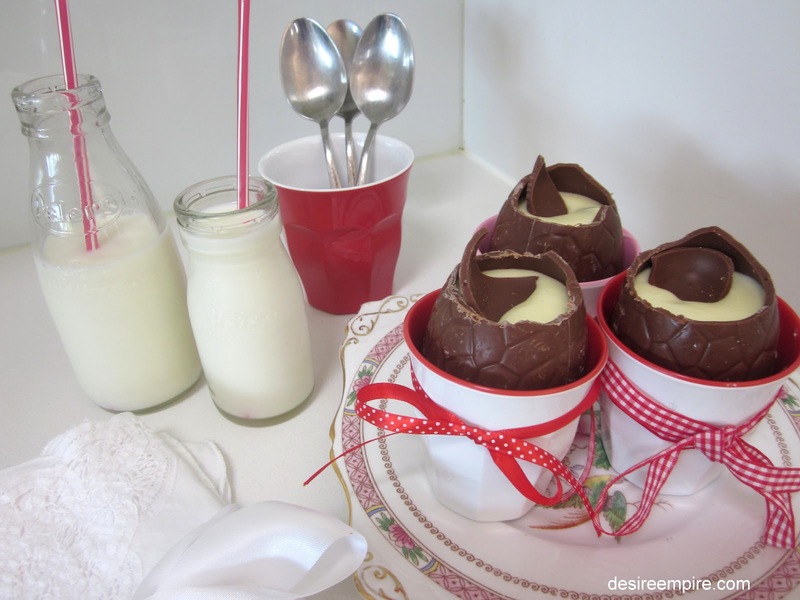 What a cute idea to use the chocolate hollow eggs. I love it!! Have a wonderful weekend. Yum! How delicious & inviting they are ... have to give this a try. Yum! Adorable AND delicious -- can't beat that! And Easter is almost here! Thanks for the idea! Carolyn, these look so scrumptious! What a great idea! I wonder if chocolate eggs come in the size of soft boiled egg holders. I have some really pretty ones for Spring. Passion fruit ice cream sounds luscious! I would love some! Come link with me with my Color Connection meme. That looks so delicious and I also couldn't help but notice the cute milk bottles in the background. Those are an adorable dessert and one that guests, young and old are certain to enjoy. Such a creative idea! A very fun and upscale dessert for Easter! 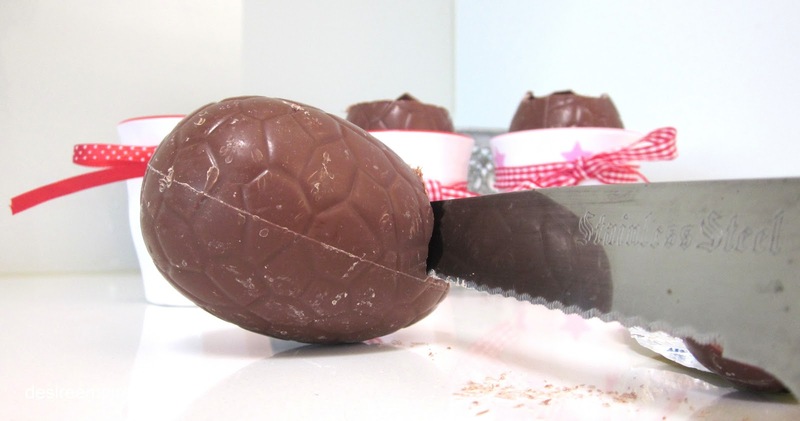 Looks delicious...What a fun Easter treat! Thanks for sharing. These look too darn good! They could get me into some trouble! Leave the making to you, but would enjoy the tasting. These really are impressive, and look delicious! Such a great idea! 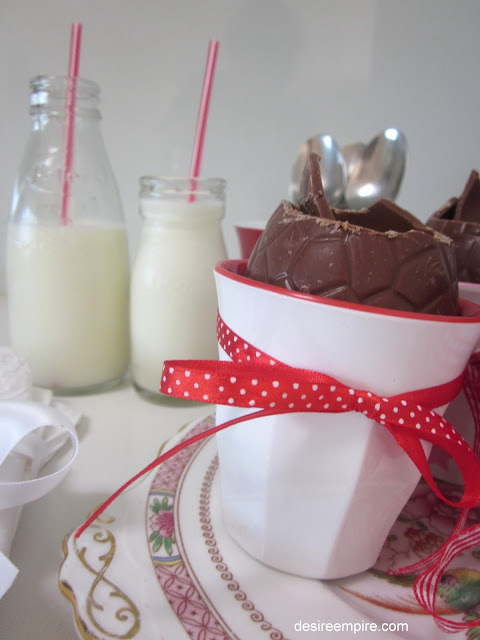 I've seen egg cups before, but never anything quite like this! This looks delicious and oh so pretty! thanks for linking to the Great Spring'tacular party! What a wonderful idea! So pretty and they look delicious! Visiting today from www.StuffITellMySister.Me ! This is one of the best idea I have seen in a long time. Thanks for the tutorial! I am linking from ReFresh/ ReStyle. Featuring this one too :) Thanks so much for linking up! OMG what a deliciously divine idea. Fantastic!